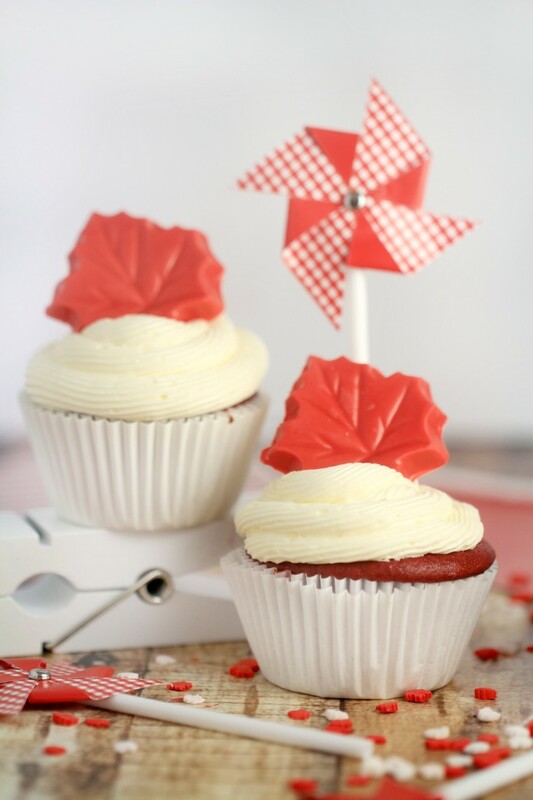 Canada Day Red Velvet Surprise-Inside Cupcakes - Frugal Mom Eh! 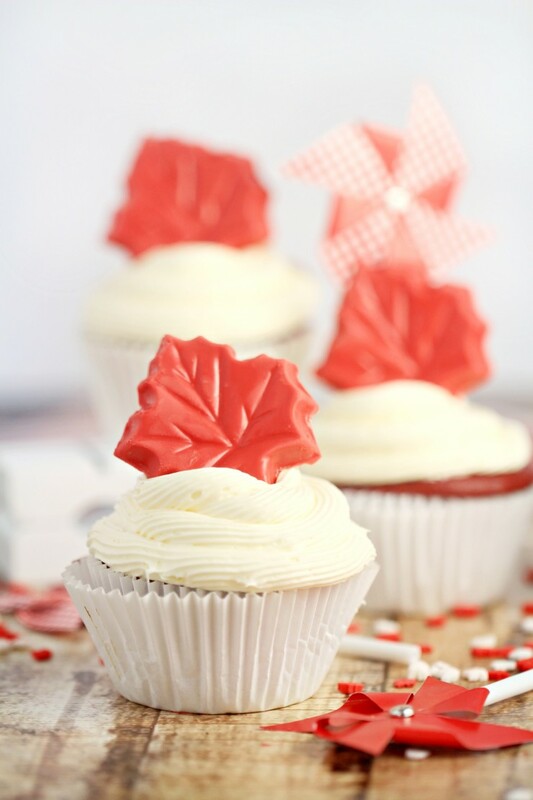 Red Velvet cupcakes may seem like an obvious choice for your Canada Day celebration, but why not kick it up a notch with these fun Canada Day Red Velvet Surprise-Inside Cupcakes! 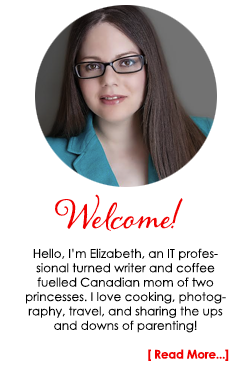 I keep seeing the internet flooded with 4th of July recipes and thought I’d spread some Canadian patriotism around too. Well that seems obvious right? 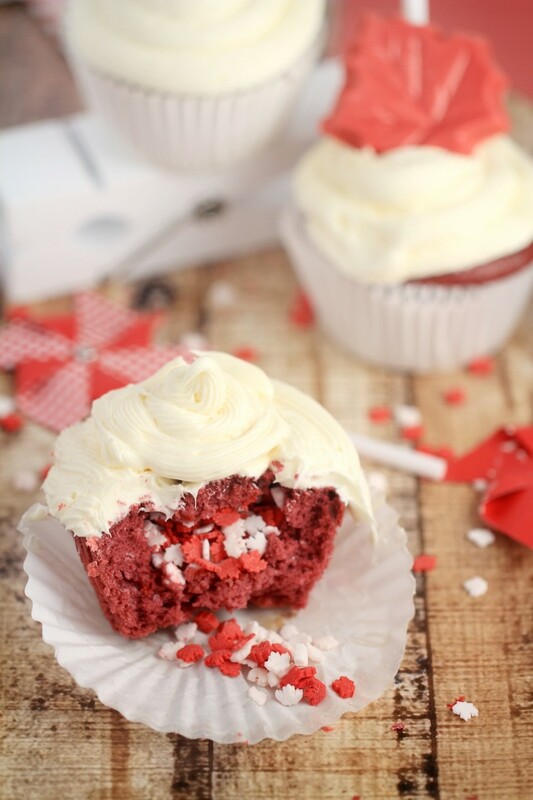 Red Velvet cupcakes! To kick these up a notch I included a special Canadian surprise inside that will especially delight children and topped them with a beautiful maple leaf candy. I mean, I came across these adorable Maple leaf quins at the bulk burn and knew I had to put them to use! 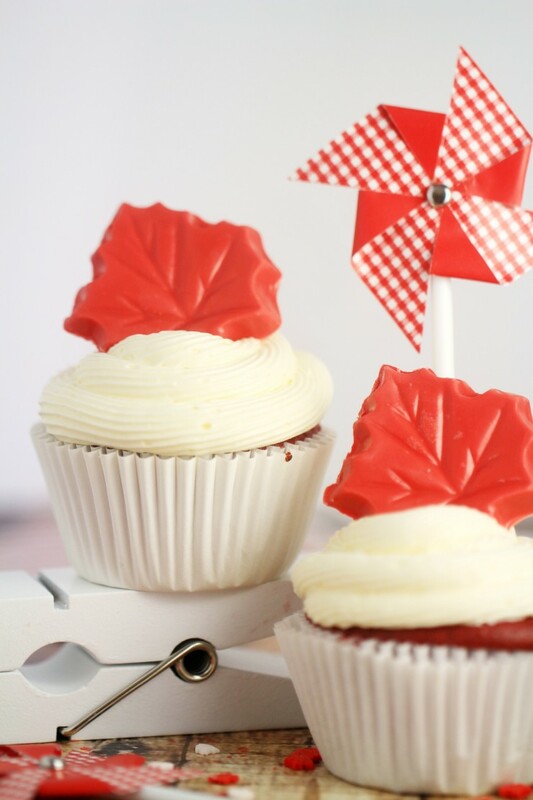 Serve these on Canada Day and you will find your party a big hit! 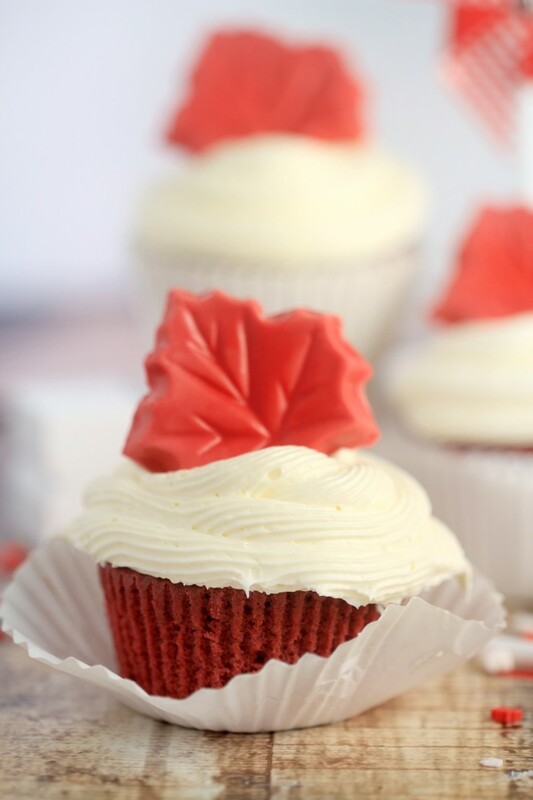 Be sure to frost these generously because, as you may know, the best part of red velvet cupcakes is the luscious cream cheese frosting! 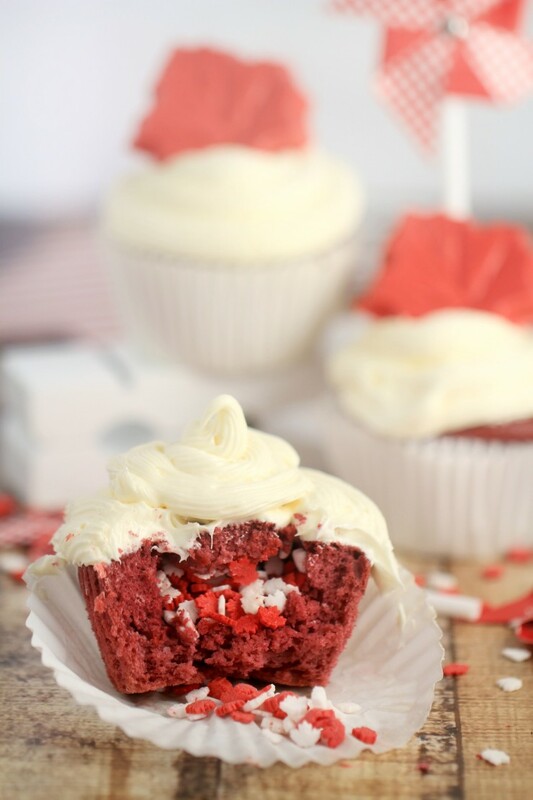 Red Velvet Cupcakes & Cream Cheese Frosting, prepared – I totally recommend this recipe OR use a box mix and prepared frosting if you want quick & easy. 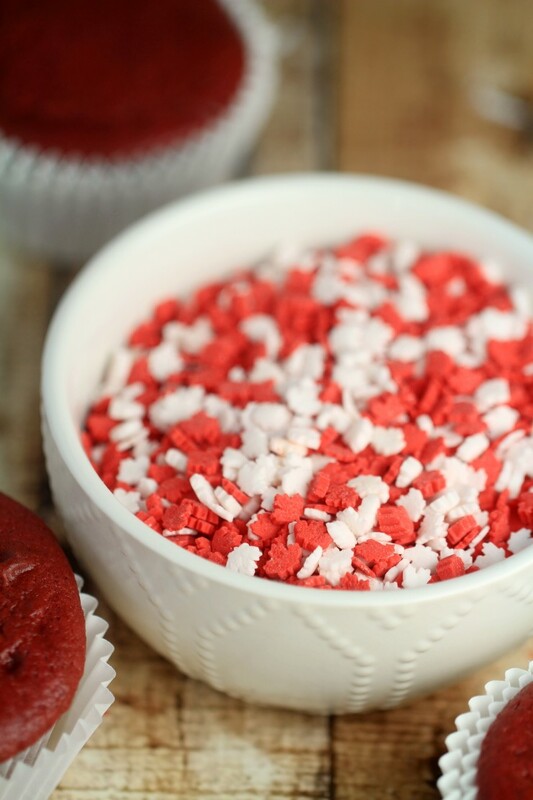 Prepare red velvet cupcakes and frosting as directed by preferred method. Melt red candy melts in the microwave in a microwave safe bowl for 45 seconds, stir then microwave again in 30 second increments until melted, and smooth when stirred. 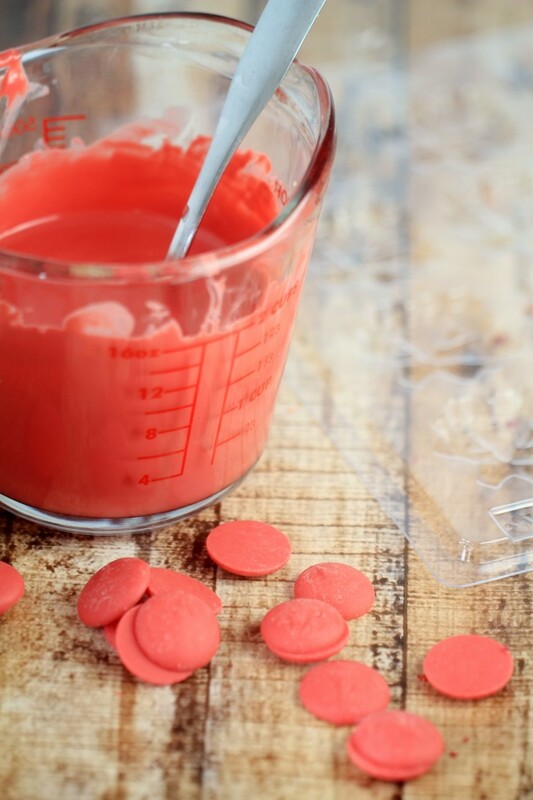 Pour melted candy into the moulds and set aside to harden. 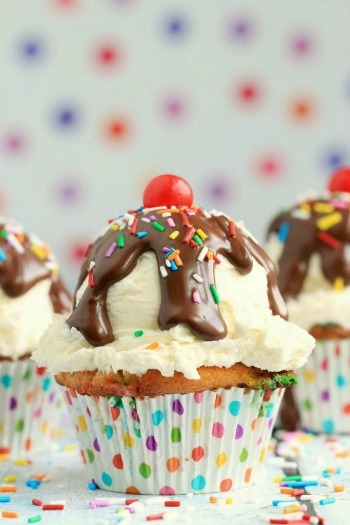 Once cupcakes are cool, use a teaspoon to scoop out a hole about an inch deep. Either eat the cap or set aside to place back on top. 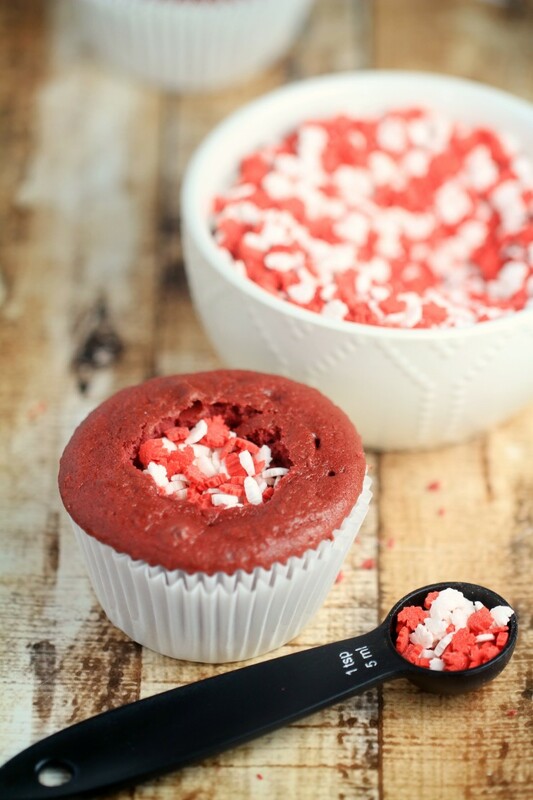 Use the teaspoon to scoop the quins into the hole in the cupcake. Cover with the cupcake cap that you removed. 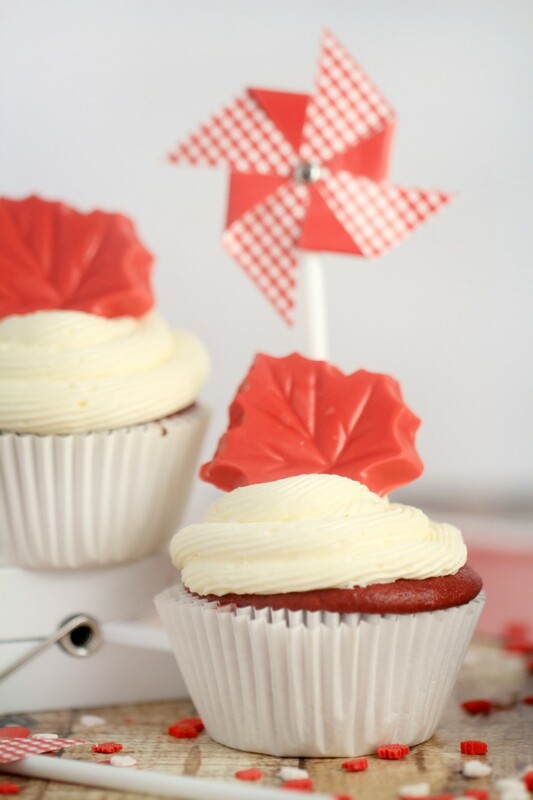 Top with hardened candy Maple Leaf. 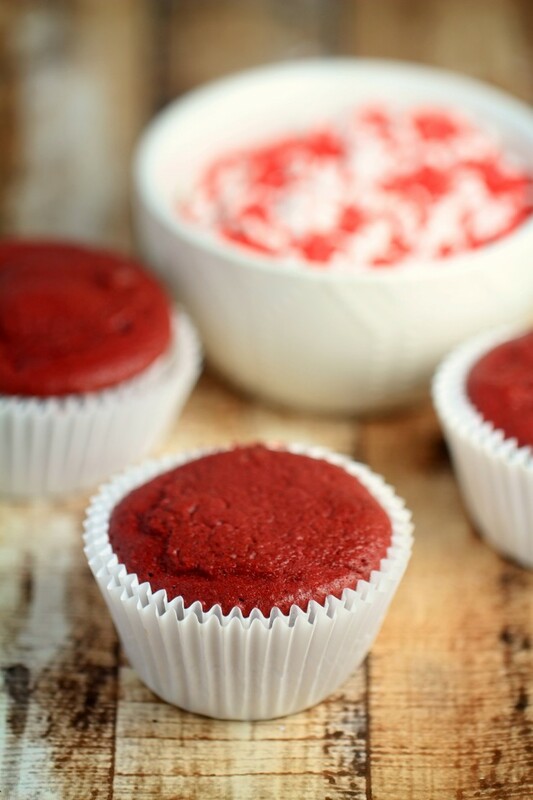 Red Velvet Cupcakes & Cream Cheese Frosting prepared - I totally recommend this recipe OR use a box mix and prepared frosting if you want quick & easy. 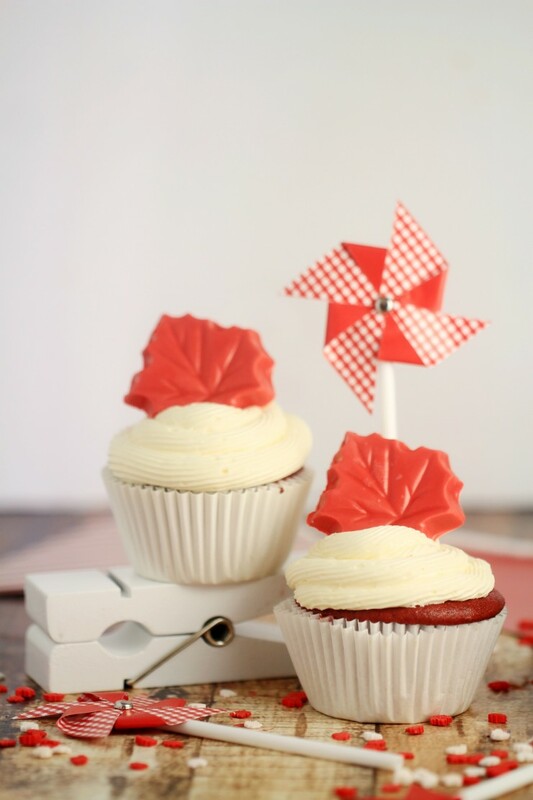 What super cupcakes, I love the idea of a surprise inside and the candy Maple Leaves, are they from Bulk Barn too? I ordered mine from Amazon but when I was in bulk barn I noticed that they do have similar. I will have to check this out at bulk barn before they are sold out. ! What did you use for the cream cheese frosting? I really like the idea of a surprise inside. , I will have to go to Bulk Barn! Thanks for sharing with us! 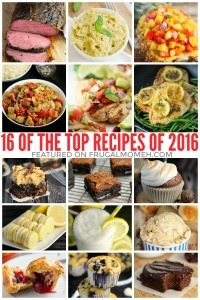 These look fun to make AND eat! 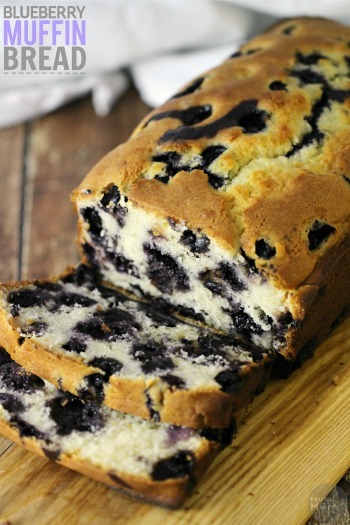 Wonder if I could do a batch or two…. How cool! These would definitely get a reaction out of all those taking a bite! 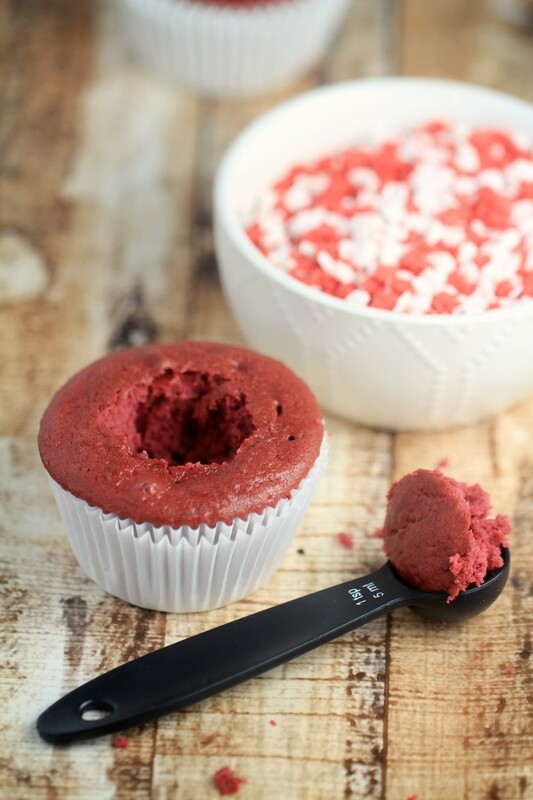 My husband’s birthday is July 1 and I think these red velvet surprise cupcakes would be a great surprise for him, but also for the rest of the family. 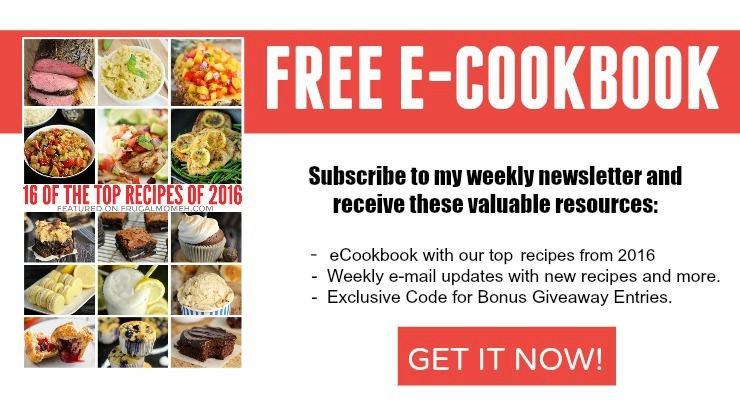 Thank you so much for this easy recipe.